About three years ago at age 62, I was finishing up my media sales management career and realized it was time to move on. My pension was set so I was lucky that I had flexibility. I knew I no longer wanted a full-time job. Retire? But to what? I don’t play golf, crochet, play bridge or enjoy any of those interests my friends do. I adore my grandson and family, but they are 1,200 miles away so a weekend four or five times a year is the best I can do. Travel, the outdoors, healthy endeavors and children are my passions. In 2013, I started to work on a plan for the next phase of life. The goal was for it to be meaningful and rewarding. I surfed the Internet looking for travel ideas, cost-effective options and different ways that volunteering would be mutually beneficial with my interests, skills and passions. My good friend bought me a book on volunteer travel. In my free time I read, analyzed and sifted through websites, books and talked with colleagues and friends. I narrowed down the volunteer organizations to those that had places I’d like to go and involved my interest in helping young people. I called each group, asked lots of questions and, most important, asked for email addresses of people who had traveled with them. That, I thought, would be the best way to learn about the pluses and minuses of a program. During my last two years of full time employment, I traveled to Crete, Greece with Global Volunteers, a non-profit, non-governmental organization (NGO) based in Minneapolis, Minnesota. The trip was wonderful. I worked with the Morfosi school, an after-school program that helps students practice conversational English. The location is breathtaking. The students are energetic and genuinely interested in learning. There was ample free time to enjoy museums, archeological sites and traditional dining. I worked with a team of volunteers who have similar goals and interests so I also made friends. I’ve also found a local, state-funded public school program near my home. Their goal is to teach immigrants basic English skills to function in the U.S. They need volunteers to supplement their work in the classroom. I emailed the director and asked to sit in a class for an hour or two. This was an eye opening experience. Students were from the Congo, Haiti, Ukraine, Egypt, Cuba, and Colombia. They all entered the U.S. under different circumstances. All wanted to be here and were thrilled at the prospect of a new life in my community. The classroom experience is totally different when each person is there because they want to be and are eager to assimilate to their new homeland. My third trip with Global Volunteers Crete program was in October 2016 and it was my best experience to date. Why? After three trips to the same island, I’m familiar with the local bus service to comfortably get around. I know the best spots for an espresso, spanakopita (spinach pie) and a cool drink beachside. The students remember me and their warmth is exhilarating. It’s a joy to watch them mature from year to year and improve their skills. When I was leaving this year they hugged me and said we hope to see you next year. By going back to the same program, I’m building meaningful relationships. I stay in touch with a handful of the students all year round via social media. I’ve made friends with the teacher and her family and am invited for coffee on the weekend with her friends. In summary I’ve had the opportunity to be part of another culture in a very authentic way. My very generous boss wanted to throw me a retirement party. I suggested he instead make a donation on my behalf to Global Volunteers and he did! I’m happy to report I’m executing my retirement plan and feel fortunate that it’s come together better than I ever dreamed! In January of 2017 I spent one week in a suburb of Havana, Miramar with Global Volunteers Havana program. Another wonderful experience that gave me a new perspective of a country I really had little knowledge of. But that’s another story. I retired 12/31/2016. I’m committed to travel and have meaningful experiences while giving back! In mid-January, I flew from Tampa to Havana on a trip that would introduce me to a country that has been off limits for me (and most Americans) for most of my life. I participated in a one-week service program in Cuba with Global Volunteers, a non-profit, NGO based in Minneapolis. 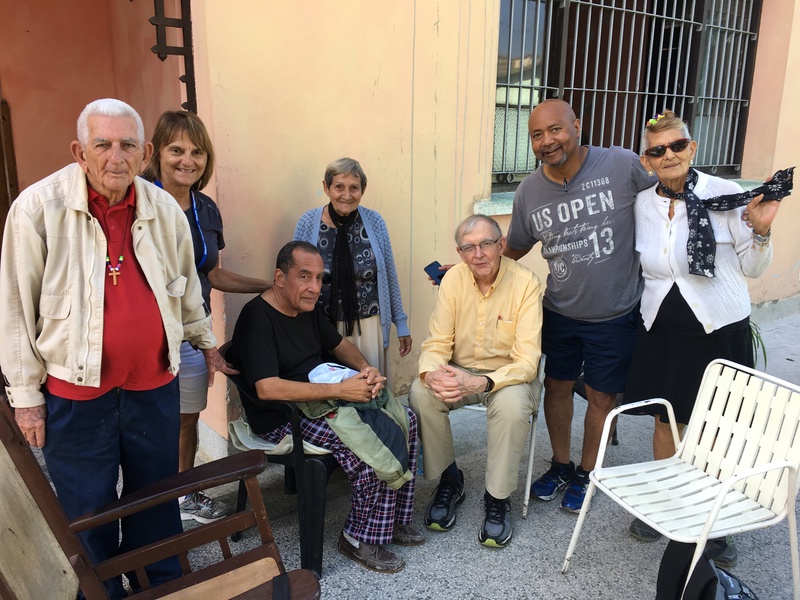 Along with 19 other volunteers ages 30-78, I spent a week on various work projects that included painting a fence at our base (The Cuba Council of Churches), spending time with seniors at a senior care center and working with students on English in an evening program. Another team did crocheting with a women’s group for part of the day. Every afternoon we had a few hours of free time before working with students practicing English for about two hours. Later we all met for dinner at various locations suggested by our excellent team leader, Stephanie. The trip was a combination of helping our host community and a wonderful cultural learning experience for a group of Americans, most of whom had never been to Cuba. We stayed in Miramar, a nice residential suburb of Havana near many of the city’s foreign embassies. All 20 volunteers stayed in guesthouses within three or four blocks of each other. We were two blocks from the water and near our base at the Council where we met each morning around 9:00. The joy of staying in a suburb is that you have the opportunity to observe people going to work and school and regularly interact with the locals. Put simply, it is a more authentic experience than staying in a hotel. You feel like a part of the community, particularly since you are there to help in some small way. We walked throughout the area every day and night. I never felt nervous nor did we see anything that looked questionable. The only danger I encountered was the uneven sidewalks, which like many of the buildings are in disrepair. Also in the evenings many streets did not have lights so we walked with caution and used flashlights when necessary. There is very little Internet on the island. Missing connectivity, we asked our hosts about options. They told us there was an “Internet Park” about a twenty-minute walk from my casa. There, they said, we could purchase a card from a mini mart or store, but we were told there are long lines and forms to fill out along with passport information. The alternative was to walk to a certain small park and connect with a young gentlemen and his pals who our hosts said would sell us a card for 5 cucs (approx $5.00 ) for one hour of internet. The card provides a password and username. My three new Global Volunteer friends and I decided to visit the park. It was trashed with empty beer cans and bottles and many young people on their phones sitting on the ground. There was a group of men standing around that looked like possibly our connection. We approached the young men and they immediately offered each of us an internet card. With our $5 purchase complete, we took a photo together with the “sellers” and then enjoyed the internet for about 30 minutes. (We kept the card for another day’s use.) Mission accomplished. As we walked back to our work site I wondered, would I even consider walking up to a stranger in, let’s say, Central Park or Chicago and purchasing an “off the grid” card with the hope it worked? And then take a photo with them? Probably not. professionals who discuss history, education and some politics. All and all, it’s a great value that includes meals and accommodations. My favorite weekend activity was the excellent quality live music everywhere day or night. Street entertainers, restaurants and bars and coffee shops all have talented solo or group performers. Artwork is plentiful and there is a wide variety of architecture including colonial, Spanish, Art Deco and contemporary. After some competitive analysis, we determine that he is competing with the fancy old American cars that all the tourists seem to love. Their hourly rate is $50 per hour. We work on an appropriate response. “Yes, those old American cars are beautiful, however, instead of $50 per hour you might want to consider my van at only $15 per hour.” He masters three or four sentences that we work on intensely for two nights. They are sure to enhance his business opportunities. It’s a pleasure to see a 23-year-old, happily married entrepreneur with such enthusiasm and eagerness to succeed. When we finished the second night, he looked at me and said “God bless you and thank you.” I was beginning to see how individuals can make a small but significant impact in a short time and, more importantly, understand these very warm and welcoming people. In addition, there are people who create and operate small businesses from their homes or garages that are serving meals, coffee/beer and other small businesses like repair shops and such. People rent rooms in their homes to visitors for additional income. This is all new and Cubans seem very happy with new opportunities. Yes, the streets, sidewalks and many buildings are in disrepair, run down and there is much need for improved infrastructure, painting, plumbing, electrical etc. Litter is an issue in some neighborhoods. For many, work is hard to find and salaries are low. Supplies of every kind are limited. Many of the local grocery store shelves are sparsely stocked. Tourists from all over world have been visiting Havana for years and now there many American visitors. In Havana we saw a cruise ship, red double-decker tour buses and souvenir shops. Colorful flora and fauna are everywhere and a walk along the Malecon — a walkway along the sea wall — is the perfect place to people watch. The city of three million is bursting with activity and a colorful history that people want to experience. It’s old, it’s new, it’s Spanish, European, modern, young and fun! I only saw a small part of Cuba on this trip. But I’m sure I’ll return again to visit Varadero, Santiago de Cuba, Trinidad and other places on this fascinating island. This entry was posted in Retirement Stories by Reader Submission. Bookmark the permalink.